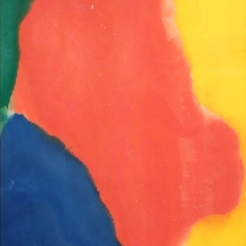 John Berggruen Gallery is pleased to present a landmark exhibition of Helen Frankenthaler paintings from 1961-1973, the first time such a group of paintings has been exhibited on the West Coast. An opening reception will be held on April 1, from 5:30-7:30. A catalogue with color plates, a complete chronology of the artist's career, and other scholarly materials is being published to accompany the exhibition. The catalogue is available for purchase through the gallery. Paintings 1961-1973 features major paintings from the artist's private collection, as well as rarely exhibited works from private collections. Among the early works in the exhibition are Pink Bird Figure, Provincetown I (both 1961) and Pivotal Square, 1962. A strong group of the paintings from 1963 includes Moat, Mountain Pool, Orange Underline, and Gulf Stream. Highlights from the late sixties include Bride's Door, 1967 and Coalition, 1968, which has been described by scholar Barbara Rose as "among the finest paintings produced anywhere in the late sixties." The exhibition concludes with works from the early seventies, Winter Energy, 1972, and Moveable Blue, 1973. The present exhibition is the result of a long relationship between the artist and the John Berggruen Gallery spanning nearly the entire forty year history of the gallery and seven exhibitions, six of major paintings. Helen Frankenthaler likewise has a long history with the city of San Francisco. Interior Landscape, 1964, on display at the Berggruen gallery in conjunction with the exhibition, was acquired by the San Francisco Museum of Modern Art's Women's Board for the permanent collection in 1968, and Frankenthaler's work is regularly featured in major museum exhibitions in San Francisco and throughout California. 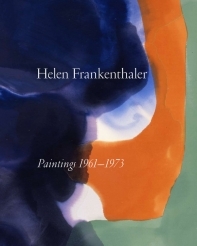 Helen Frankenthaler is the recipient of numerous honorary degrees and awards. Her work is represented in most major museums throughout the world, such as the Hirshhorn Museum and Sculpture Garden, Washington, D.C.; Los Angeles County Museum of Art; The Metropolitan Museum of Art, New York; National Gallery of Art, Washington, D.C.; National Galleries of Edinburgh; Victoria and Albert Museum, London; Smithsonian American Art Museum, Washington, D.C., and Whitney Museum of American Art, New York.